Dr Serge Liberman, medical general practitioner to a generation of people in Carlton, Brunswick and other inner suburbs, died on 22 December 2017. Here are thoughts and recollections from some of those for whom he was a treasured doctor, friend and writer. There are many skilled doctors and writers in our community, but most don't have necessarily have skill in both areas. Serge Liberman did, he was a good doctor and a good and interesting writer. In addition, as a humanist and humanitarian, he had great people skills. No wonder people in Carlton followed him up to Brunswick when he moved from one suburb to the other, or flocked to his talks when he gave them. Serge had the capacity to involve you, as his patient, in what was happening to you, to explain, to answer all your questions honestly and sensibly, thereby treating you with respect. He always knew your history, even long term, over forty years for some members of our family. He was also very likeable and so many of his patients regarded him as a friend; even when they did not share his ethnicity they still enjoyed his writing and excellent scholarship. He would also have made an exceptional teacher. He will be sorely missed. There are many stories I could tell about Serge Liberman who was our GP for decades. The one I shall tell comes from when he had retired, and it illustrates his compassion and empathy with his patients. About a year after he left the Lotus Medical Centre he read the death notice I had placed in the newspaper regarding my brother in law's death from pancreatic cancer. Anne Marie and I were both surprised and moved by the letter we received from Serge shortly afterwards. In it he expressed his best wishes and sympathy for our loss. He concluded with a typical dry joke that Anne Marie's unusual surname helped pick out the notice from all the others! As patients of Serge Liberman in Carlton and Brunswick from the 1990's until his retirement in around 2013, my wife Shelley and I came greatly to appreciate his excellence and warmth as a GP but also his scholarly and literary interests. He was a late-20th-century version of Anton Pavlovich Chekhov, who was likewise a doctor and master of the short story. As a Russian-speaker and translator myself, I enjoyed our conversations on cultural matters during consultations. Serge received the Alan Marshall Literary Award in 1980 and 1981, and Shelley and I have an autographed copy of his 2011, 836-page magnum opus, 'The Bibliography of Australasian Judaica 1788-2008'. Serge will be much missed. It is a rare privilege to have the wise counsel and empathy of the same doctor from the gawky edge of early adulthood until the wistful edge of retirement. I first went to the Lygon St clinic in the early 1970s with a throat complaint and soon found myself settling to see Serge whenever possible, following to new offices in Brunswick by the mid 1990s. The strictly physical complaints, increasing as I aged, he dealt with smoothly and competently, and I soon found I could also trust him to advise on matters of emotional health, with the same warm efficiency. I also discovered in his writings how deep his understanding of others could go, such as in his short story, published in The Age, of an elderly Italian widower readying to leave for Australia. Upon his retirement in 2013 I felt a door was closing on a large part of my life. Now I know it is shut for good. Addio Serge. Serge Liberman was a popular doctor and you sometimes had to wait a while to see him, but he always gave you his full attention and care. One day I was sitting in the waiting room, suffering from what I thought was the world's worst cold, when I heard a terrible hacking cough coming from the consulting room. My symptoms were trivial by comparison with this patient, who sounded like they were at death's door. Imagine my surprise when I discovered that the "patient" was, in fact, Dr Liberman himself. He was obviously unwell, but he was still seeing a few patients before going home to rest. He wrote a certificate for my time off work and, with his characteristic humour, he pushed a blank form towards me and asked if I could write a certificate for him. I gave him the rest of the week off. An obituary, with an overview of his life and work, appears in the Sydney Morning Herald. As well as his medical work, Serge Liberman was a chronicler of Jewish, and also of other migrant lives, in Carlton and other parts of Melbourne, which came alive in his writings. Much of his writing output can be found at his website. 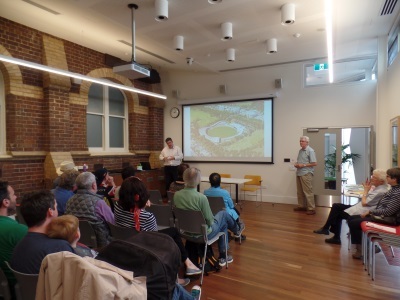 In December 2014 Serge Liberman gave a talk to the Carlton Community History Group entitled "Writing Jewish Carlton". A copy of the talk can be found on the Academia website. Two well known Carlton businesses - Dracula's Theatre Restaurant and Canals Seafood - shut up shop in 2017. Dracula's began in Drewery Lane, Melbourne, in 1980 and moved to larger premises at 96-100 Victoria Street, Carlton, ten years later in 1990. The converted brick factory site, on the corner of Cardigan Street, was originally designed by architect P. Hudson in 1912 and built by F. Frenchman for Ross, Robbins Co., brassfounders. Dracula's final performance was on Saturday 23 December 2017. Canals Seafood, at 703 Nicholson Street, North Carlton, celebrated its 100th anniversary in 2017. The business began as a fish and chip shop, operated by Spanish migrants Joseph and Maria Canals, in Collingwood in 1917. They moved to North Carlton in the early 1930s and took over an existing fishmonger's shop, which had been in Nicholson Street as early as 1905. Canals is a family business in the true sense, with successive generations learning the trade from their elders and making their own contribution to developing the business. Over the decades, migrants from Europe, like the Canals family, have done much to influence the Australian taste for fish and seafood. In 2017, the demand for quality seafood was greater than ever and the Canals brothers, John and Peter, chose to end on a high note and give themselves a well-earned break in retirement. The shop building was auctioned in October 2017 and a new seafood business, The Fishmonger's Son, opened in May 2018. Building occupancy information has been sourced from Sands and McDougall directories. Building design information has been sourced from the Australian Architectural Index and Building Application Index. 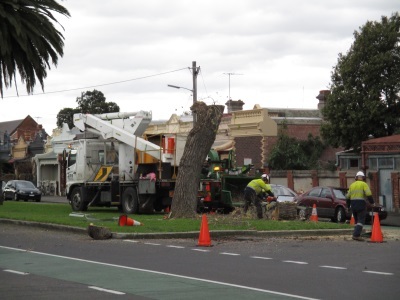 Curtain Square in North Carlton has had a major landscape change, with the removal of twelve elm trees from its north/south avenue. 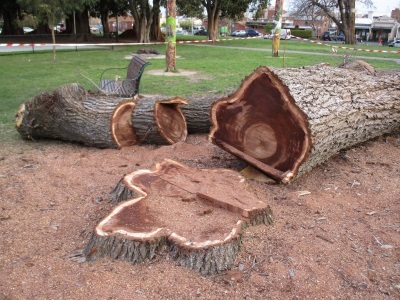 Six of the mature elm trees, estimated at 100 years old, were assessed as having structural defects and they posed a serious risk to public safety. The remaining elm trees, from more recent plantings, were not growing well in their current position and their removal allowed for a new avenue of 16 trees to be planted. The Scarlet Oak, Quercus coccinea, was selected as the replacement species. 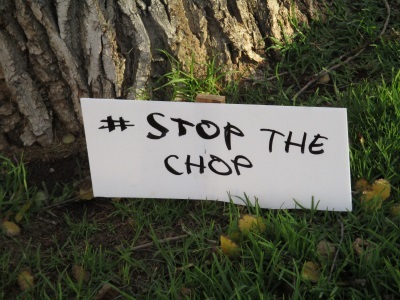 Tree removal took place in September 2017 and care was taken to minimise disruption to the resident wildlife population. Of course, it will take some time for the new avenue of trees to become established, but Curtain Square has gone through many changes in its history. Curtain Square occupies 1.46 hectares of the area bounded by Rathdowne, Canning, Curtain and Newry Streets and the land was first reserved for recreational purposes in May 1876. However, it had an earlier history as a quarry worked by convicts from the Collingwood Stockade from 1853 to 1866. The convicts spent their days doing back breaking work in the quarry, hewing blocks of bluestone with hand tools, then they were marched back to the stockade (now the site of North Carlton Primary School in Lee Street) to be locked up overnight. The contrast between the work of the convicts and the amenity of Curtain Square as a public recreational space could not be greater. A report in The Argus of April 1877 spoke in glowing terms of the area being "hardly recognisable as the place it was 12 months ago". The old quarry holes were filled in and the area was planted with a variety of trees and shrubs in pleasing arrangements. It was noted "the great hollows which formerly existed have been filled up with street sweepings, and are now being covered with a thick layer of mould." The legacy of this infill material was noted a hundred and fifteen years later in the Curtain Square Masterplan of 1992. Cracks in the walls of buildings, constructed in the 1930s and 1940s, were attributed to subsidence on the former quarry site, as was the tilt of the elm trees in the vicinity. The buildings, a "men's shelter" and a toilet block, were demolished in the 1990s. The reserve, also known as Curtain's Square, was named in honour of John Curtain, who was instrumental in having the land reserved for ornamental and recreational purposes. He was a Melbourne City Councillor and Member of Parliament, the publican of several hotels in Carlton and a well known real estate developer, who at one stage owned over fifty properties in Carlton. Curtain Street, on the northern boundary of the square, is also named after him. The Argus, 6 April 1877, p. 5. This article includes a detailed list of trees planted in the reserve. It is with great sadness that CCHG notes the death at 93 years old of "Bea". Her recollections of her Carlton childhood were recorded in 2010 and provide a vivid insight into the kind of lives lived by poorer residents in what was then a vibrant working class suburb, as well as describing the effects of the outbreak of World War 2 on a young woman just finding her feet in the world of employment. Bea married soon after the war and over the decades raised a family of four and gradually acquired the professional qualifications and experience she had missed out on when she left school at 14. Additionally, at the age of 64, she undertook an Arts degree majoring in Art History and Italian. She described those years at university as the highlight of her life. It was characteristic of her energy that, when she was interviewed at the age of 86, she was still employing an Italian tutor to work with her and a small group of friends in maintaining their language skills. Bea spent the last couple of years of her life in an aged care home, something her daughters suggested to her with some trepidation as a temporary respite but which, characteristically, she enjoyed so much that she immediately elected to make it permanent. Vale Bea, a full life indeed. Who would have thought that waiting for her friend to change her stocking could have made such a difference? Read Bea's story and find out how this seemingly trivial event had a big impact on her young life. Good news for Rathdowne Street shoppers - the former St Clements greengrocer, which closed in February 2017, has re-opened under new management in May 2017. Senserrick, currently at 687 Nicholson Street North Carlton, is expanding its business into Rathdowne Street. Senserrick and St Clements are the latest in a long line of greengrocers that have occupied the shop at 384 Rathdowne Street since the 1930s, with the exception of a few years from the late 1940s when it was a wholesale hardware business. 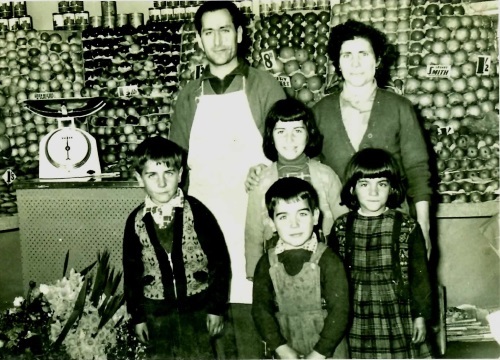 Longer term residents will remember the Tucci family, who operated the greengrocer's business from the mid 1950s through to the 1990s. The purchase of fruit and vegetables was often accompanied by an impromptu Italian lesson, courtesy of Francesca and Paolo. They retained ownership of the building after their retirement and the business has been continued by a succession of greengrocers. Paolo died in April 1993 and Francesca in June 2016, at the age of 90 years. Both were buried in Melbourne General Cemetery, Carlton. 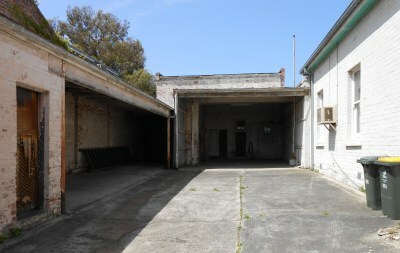 The two storey shop building was sold in late 2016 and 384 Rathdowne Street is once again selling fruit and vegetables. The Travelling Samovar closed in late 2016 and the former tea house entered the next phase of its history as the café Extension of Time, opened in February 2017. The new café retains a link with the Travelling Samovar and has a small selection of Samovar teas available. The two-storey building at 412 Rathdowne Street, North Carlton, which dates back to the 1890s, was a tobacconist shop for sixty years. None of the subsequent business occupants - pastrycook, confectioner, milk bar, picture framer, noodle shop, café or tea house - can rival the tobacconist in terms of longevity. Read more about the tobacconist shop that became a tea house. One of Carlton's earliest extant hotel buildings, on the corner of Leicester and Pelham Streets, was demolished illegally over the weekend of 16 and 17 October 2016. 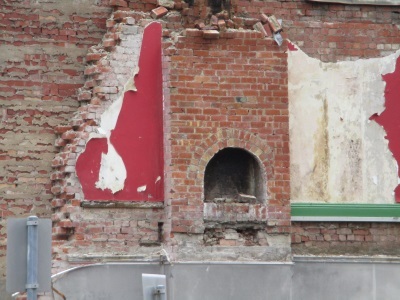 The Corkman Irish Pub, which was subject to a heritage overlay, was reduced to rubble, despite a stop-work order being issued by the Melbourne City Council. The hotel was originally built as the Carlton Inn and first licensed to George Edmonds (Edmunds) in 1856. Over the next one hundred and sixty years, the hotel served many glasses of beer and played host to generations of university student pub crawls. At the time the Carlton Inn was built, the area north of Victoria Street, including Carlton and parts of North Melbourne, was not subject to the provisions of the Melbourne Building Act (1849). Buildings could be constructed and demolished without permits and this contributed to the somewhat haphazard development of Carlton in its early days. Nowadays, there is a rigorous system of planning, building and demolition permits in place, but this was not enough to save the Corkman Irish Pub, which will be sadly missed. At CCHG's September 2016 meeting, Dr Renate Howe gave an interesting presentation on the battle for Melbourne's inner suburbs in the 1960s and 1970s, based on the book Trendyville, which she co-authored. Dr Howe has kindly allowed CCHG to post a copy of her presentation notes on its website. If you missed the meeting, or if you would like revisit Trendyville, you can view the notes here. The book Trendyville is available from Monash University Publishing. 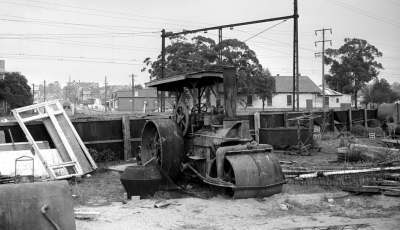 1 Elgin Scrap Metals Pty Ltd owned the corner site from 1980 to 1984, when ownership was transferred to Mordcha Pty Ltd.
2 Bank branch locations sourced from advertisements in Sands and McDougall. 5 The National Bank of Australasia was established in 1858, two years after the Colonial Bank of Australasia. Rathdowne Street had to wait another four decades for its plantation, implemented in almost opposite circumstances. The controversial eastern freeway opened in 1977, amidst protests from Council, local businesses and residents alike. Rathdowne Street had become a feeder road for the freeway, via Princes Street, and Council proposed a median strip to slow down traffic and improve local amenity. 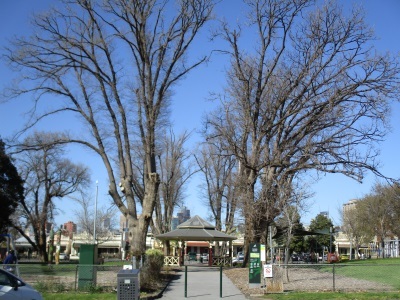 This proposal was successful and, decades later, the median strip of mature trees contributes to Rathdowne Street's unique character and continues to be an asset, rather than a hindrance, to local businesses and residents. The Carlton episode of Tony Robinson's Time Walks was broadcast on ABC 1 on Friday 20 May 2016. Naturally he covers the Trades Hall and the Eight Hour Memorial. But if his points of focus are predictable, his treatment of them is not necessarily so. The Exhibition Building? Check! But instead of dwelling on the architectural wonders, he describes the unpleasant state of the grounds in the early days and recounts a nineteenth century academic scrap over the palaeontology collection housed in the basement. Italians? Of course, but after we see a venerable espresso machine and hear Nino Borsari's son tell his father's story, a visit to Dorrit Street deftly combines the stories of Carlton's early Italian migrants, who arrived about 1890, the Viggianese street musicians, and that of Jean Lee, the last woman to be hanged in Australia. Her story is the only reference to the seamier side of Carlton's history, something of an imbalance perhaps. The program moves on to La Mama and an extended segment explores the flavour and political influence of one production from this long-running and hugely influential Carlton institution. Inevitably in such a short program there are omissions. There is no coverage of the Jewish presence in Carlton. We see the grand terraces of Drummond Street, but learn nothing of their decline into boarding houses in the early twentieth century or of the gradual gentrification of Carlton as a whole from the 1970s. The 2016 footy season kicked off with a lively presentation by Tony De Bolfo at the Kathleen Syme Library and Community Centre on Saturday 2 April. 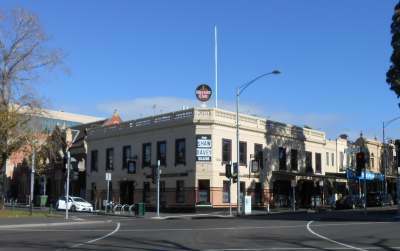 Tony de Bolfo, official historian of the Carlton Football Club, traced the Club's origins back to a meeting at the University Hotel, corner of Lygon and Grattan Streets, in 1864. This was the start of a long association with Carlton pubs, including the use of the Clyde Hotel, corner of Cardigan and Elgin Streets, as change rooms before the Club was granted a permanent home at Princes Park in 1896. Tony's presentation featured historic photos of the Club and its players, and the houses in Carlton and Parkville where some of them lived. This signage recalls an earlier era, when mixed bathing was a novelty. 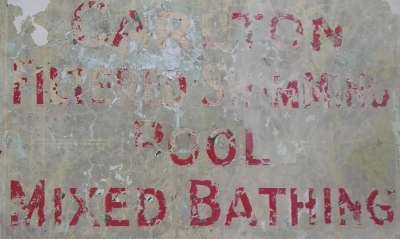 The Carlton Baths celebrated its 100th birthday with a pool party on Saturday 13 February 2016. Gina Basso : A Film Star at 83? The Carlton Community History Group has previously demonstrated its admiration for the persistence and hard work of Giacomo and Gina Basso and we registered our condolences on the death of Giacomo in September last year. Speaking to Gina just recently it is clear that, despite missing her husband badly, her determination and strength of character remain undiminished. Gina continues to work in the tailoring business she and Giacomo set up so many years ago but now she works on alterations mainly by herself, although her grand daughter spends a couple of hours a week working with her. She explains, "It's a bit hard", but she has to pay the bills. Work also helps her maintain her English. Her son calls in about three times a week to ensure she is alright and has successfully negotiated the 18 steps she walks up and down every day to reach the rooms on the second floor of the dwelling. 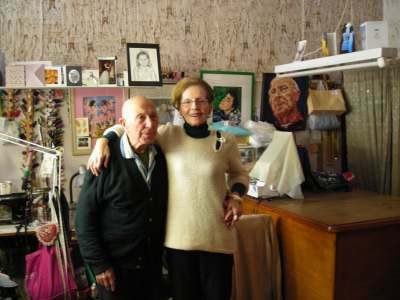 She still enjoys cooking for him and other members of the family, like her grand daughter who, when she was only 14, painted a splendid portrait of Giacomo. However, as Gina says "Age makes things difficult. It's as if there is no future. Life is not for you." Nevertheless she keeps going, although living by herself means it is difficult having no one to mull over things which happen every day or sort out problems. Gina is about to have another birthday and she has just been approached by a film company wanting to make a film about her house and the business. As she continues to maintain her charm and good looks, and knowing the complexity of her history, and how versatile she has proved herself, it seems very likely she could be a film star at 83. CCHG wishes Gina well, is proud to know her and looks forward to the film adding to our record of local history. More information on Giacomo and Gina Basso. 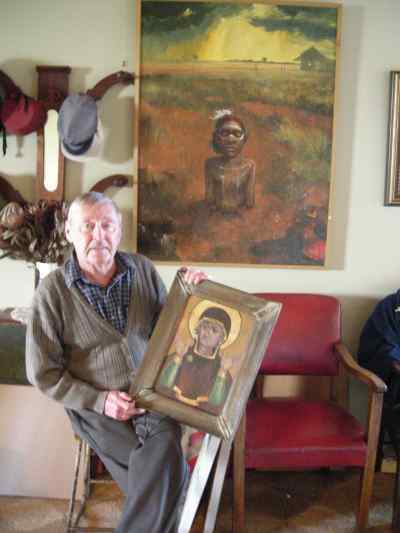 It is with deep regret that the Carlton Community History Group notes the death of Des Norman, on 13 September 2015, and sends condolences to his thoughtful wife Stella, and other family members, including their daughter Ruth, who brought Des's work to our attention. He will be sadly missed. CCHG got to know Des in the process of working on his book of paintings, which we published as Through the Eyes of a Child : A Street in Carlton, 1939-45. He was extremely generous and the more contact we had, the more we valued his insights. His was an unusual approach to our local history and offered a unique glimpse at what it was like to live through the war years in Dorrit Street, Carlton and attend the Faraday Street school, now the Kathleen Syme Centre. That selection of his paintings throws light on his experiences as a boy, living in a small house, whose bedroom was the narrow front verandah, with only a canvas blind between him and the street. A street where he and his friends went to school and played together, or observed the adults of many cultures he knew or saw, going about their lives, in war-time Carlton. It is an extraordinary and extremely valuable record. This book is only a part of Des Norman's enormous contribution to art, from early works on Daisy Bates, a collection portraying the battlefields of Gallipoli and a resurrection series, to other major exhibitions, restoration work, commissions and illustrations. As a fellow staff member of the Melbourne Church of England Grammar School said, his work 'encapsulates honesty and sensitivity' in presenting images which 'can be sensually poignant and at the same time, disturbingly evocative'. Des Norman was farewelled by family and friends on Wednesday 23 September 2015 and he now lies resting in Kangaroo Ground Cemetery. The date was specially chosen by Stella, as it would have been their 65th wedding anniversary. In August 2015 CCHG received an email asking if we were interested in a centenary souvenir booklet of the Queensberry Street Primary School. The answer was, of course, a resounding "Yes" and we have now taken delivery of the booklet, which charts the history of the school from its opening in 1881 and closure in 1932, through to its later function as the Education Department Physical Education Branch. The former school building at 224 Queensberry Street Carlton is now home to the University of Melbourne Queensberry Children's Centre. The school (S.S. no. 2365) rates only a passing mention in Peter Yule's book Carlton : a history, so the booklet will be a valuable addition to our small resource collection. CCHG thanks the Surrey Hills Neighbourhood Centre Heritage Collection for this generous donation and also for thinking of us - for that's what community is all about. 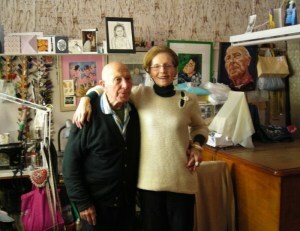 In 2013 Giacomo and Gina Basso celebrated living and working in Rathdowne Street for over 60 years. That by itself is some feat, but when people realise something of their Italian backgrounds and the various trials and tribulations this steadfast, courageous couple have weathered, the celebrations seem low key for a 93 and 81 year old. Both of them came from large extended Italian farming families, in an area depressed by urban development. Both experienced the 2nd World War on the losing side and both started working very young - Gina part-time from the age of 7, to fill in the half days she was not at school while her mother worked more hours on the family farm, and Giacomo at 13, as he was the eldest of four who had to help support his family after his father had died when Giacomo was 9, and his mother died 7 years later. While Giacomo's training was limited, Gina thoroughly learned dressmaking and embroidery until at 15 she began training as a men's tailor in the place where Giacomo was working. They fell in love and have been together ever since, apart from the separation when Giacomo went to Turin in late 1949 to make robes for the Christian Brothers and then migrated to Australia, not his first choice. He sold his only asset, some land, to pay his fare and with the support of a Myrtleford tobacco grower and his Italian friend Sante Forte, he landed in Australia in early 1951. Almost immediately finding a job, earning money and learning a new language were problems for the 32 year old, who wanted to save enough to bring Gina to Australia, despite the fact that Gina's mother was unhappy with her leaving. 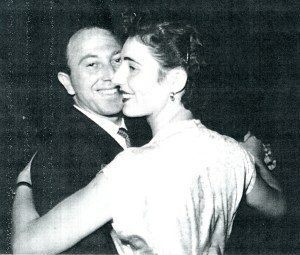 They were married by proxy, with one of Giacomo's brothers, Giovanni, standing in for the bridegroom on 6 July 1953, while on the same day in Australia, Giacomo and another of his brothers, Antonio, paid the deposit they had saved on what was then a dilapidated building in Rathdowne Street, in which they still live. As a couple they faced living and working as tailors in the same place, home renovations with very limited funds, rearranged mortgages, the problems of learning a new language for Gina and learning to drive for Giacomo, lack of privacy, council regulations, noise from traffic and machinery next door, as well as drunken customers from the Kent Hotel. These were balanced against having a son, Robert, family connections, good and generous friends and neighbours, both Italian and Australian. "It has been hard at times, particularly when sickness strikes, but very rewarding. We have enjoyed our life and are proud of what we have done together and how we have weathered adversity at times. We have real joy in each other, our son, his wife and children, our lovely grandchildren, our in-laws have been an added bonus. We have been very fortunate to have our son marry into a supportive family." Sadly, Giacomo died on 19 September 2014. He was a well respected member of the local community, with a friendly word for all, combined with a slighly cheeky twinkle of the eye. Carlton Community History Group acknowledges the generosity and openness of this remarkable family. Contact CCHG for access to interview transcripts and other material on the Bassos. 7 The two-storey house at 8 Shakespeare Street was condemned by the Housing Commission in 1970, but it was declared fit for human habitation after the required repairs were completed. 1 The survey recommendations were submitted to the Hon. H.R. Petty M.L.A., Minister of Housing, on 24 June 1960 and appeared in the Report on slum reclamation and urban redevelopment of Melbourne inner suburban areas, dated 21 July 1960. 2 Area no. 4 (approximately 74.2 acres in Carlton) was bounded by Princes, Nicholson and Lygon Streets and the rear of properties facing Elgin Street. 3 Area no. 4A (approximately 49.0 acres in North Carlton) was bounded by Lygon, Fenwick, Canning, Princes, Rathdowne and Lee Streets, excluding Curtain Square, the Kindergarten and Primary School. 4 The Australian Dictionary of Biography cites 1863 for John Curtain's Hotel, but this date is not supported by the evidence of Melbourne City Council Rate Books (VPRS 5708), Liquor Licensing Records (VPRS 7601) or a statutory declaration signed by John Curtain in 1882 (VPRS 460/P1/1154/50881). 5 Hotel names information sourced from Sands & McDougall and the R.K. Collection of Hotel Records. While many areas of the inner suburbs were lost to slum reclamation, community action and changing attitudes to social housing have meant that the Shaw Davey survey recommendations were never fully realised. In an almost complete turnaround, architects and builders are now coming up with creative solutions for rebuilding on small sites, which are in great demand and can command high prices. Carlton has a new street, on the former Housing Commission redevelopment site. Colgan Street runs for one block between Rathdowne and Drummond Streets, providing access to the new Australian Unity retirement living and aged care facility at 497 Rathdowne Street. Unlike nearby Reeves Street, which originally dated back to the 1860s, there was no pre-existing street at this location. However, the street name has historical links with both Carlton and Australian Unity. James Colgan was born in Melbourne in 1846, the son of John Colgan and Margaret Leary. A law clerk, he was one of the founding members of the Australian Natives' Association (A.N.A. ), a friendly society formed in 1871. He was the first Treasurer of the Board of Directors in 1877 and was appointed Secretary in 1878. He retired in 1881 and became a Trustee. James Colgan was a resident of Carlton and lived at 345 Canning Street towards the end of his life. He died on 13 August 1899, one month short of his 53rd birthday. He was survived by his widow Sarah Agnes, who he married in 1872, and two adult children. Members of A.N.A. 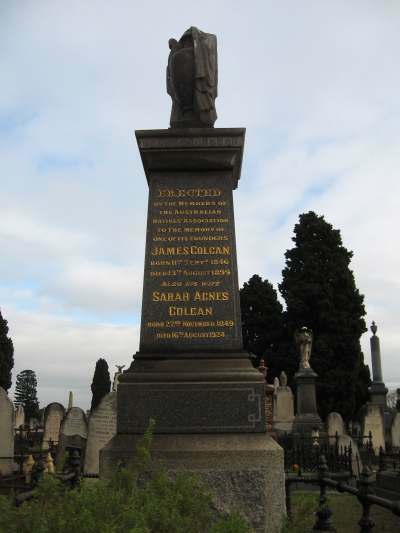 subscribed to a fund for the erection of a memorial stone above his grave in the Melbourne General Cemetery. The memorial stone was unveiled on 30 August 1901. Sarah Colgan died in 1924 and was buried with her husband. A.N.A. merged with Manchester Unity and became Australian Unity in 1993. Pat Knox, Carlton identity and owner of the Poppyshop, retired in 2014 after 47 years of business in Lygon Street. 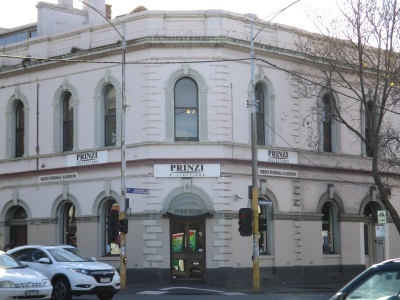 During that time, Pat has seen many changes in manufacturing and retailing, within the broader context of major social and political change in Carlton from the 1960s through to the present day. A savvy businesswoman, Pat has remained true to her ideal of selling good quality toys and gifts at a reasonable price. One of the things that people love about the Poppyshop, and I love it too, is that it's a happy place. People come in and they're happy, they're nice, they talk to each other. I have a lot of people who come in nearly every day, lonely people and they just come in and say "Hi" and we have a chat. Pat Knox and the Poppyshop have made so many people happy over the years. CCHG wishes her every happiness in her retirement. The sale in February 2014 of the property at 183 Macpherson Street has broken one of the last links with the Jewish era in North Carlton. In 1926 the recently-emigrated Pahoff family took over the house and dairy at this address, running it until the 1960s when such businesses were no longer viable, and the house has remained in the family ever since. Like Glickman's bakery, Polonsky's butcher shop and Gotlib's grocery, Pahoff's Tel Aviv dairy features regularly in Jewish memoirs. The sour cream, it appears, was especially good. But the family is perhaps even better remembered for its remarkable work in sponsoring and organising the emigration of no fewer than forty families from their native Ukraine. It was with great sadness that CCHG heard of the death of Ruth Bailey in late December 2013. In 2010 CCHG was extremely fortunate in having the opportunity of interviewing Ruth, who was, like her mother and maternal grandmother, a Carlton girl born and bred. 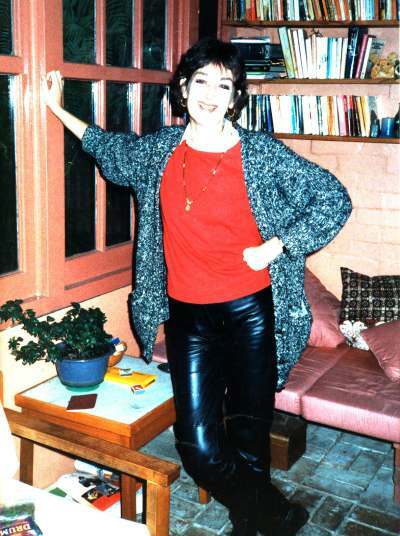 Born in 1941, Ruth spent her childhood in what is now the first house north of the Carlton Gardens on the eastern side of Rathdowne Street and attended the nearby school, now Carlton Gardens Primary. She was also a regular visitor to a house in Palmerston Street opposite what is now Neill Street school. Her mother Keziah Blackburn had grown up in that house and her grandmother Alice Booth lived there during her long widowhood. When in the 1960s Alice became too frail to live alone, Ruth was newly married with a young baby and delighted to move into the house and area she knew so well. She remained there until her death. Ruth was a delightful person to interview, with tremendous recall of detail, endless anecdotes and the rare ability to structure what she had to say so that it was effortless for her listener to follow her story. As a tribute to Ruth, CCHG has published a new booklet titled "Carlton Girls Born and Bred". Visit our publications page for more information. Sadly, John Duncan, a CCHG supporter and contributor, passed away in 2013. He first contacted us several years ago, having enjoyed some of our material, and provided a great deal of colourful detail about his childhood in Princes Hill in the 1950s. It was, he said, a wonderful place to grow up. On the other side of the railway line a little west of the station (now the North Carlton Neighbourhood House) was a massive junk yard, complete with dog and grumpy old watchman. We used to find all sorts of things including horse shoe nails, boxes & boxes of them. Despite many boots in the backside it was a favourite playground, as was the cemetery. The only school excursion I ever went on was a "trip to the country" by train to Diamond Creek for the day, with the nuns in all the heavy black regalia of the day and it was so hot. It was on days like this that the kids enjoyed their local "pools", a huge tank in the local dye works and another at what was then Pullars Dry Cleaners in Rathdowne Street. John recalled the names of many local shopkeepers, especially those near the corner of Lygon and Paterson Streets where he went to school. He remembered crowding into a neighbour's house to watch the first television set in the street, and the dairy across the road at 69 Wilson Street. Carlton had a bad reputation at the time. At a very tender age I knew of several sly groggers who the locals could go to to buy beer after hours and even Sundays, then there were at least 3-4 SP Bookmakers within walking distance of home. Dad ran one with his mate behind the Rising Sun Hotel. One of the best of John's stories has been recorded on the Recollections page of this website under the heading Mr Briggs' Business. CCHG is deeply grateful to John and those like him who record their memories. Our sincere condolences to his family. 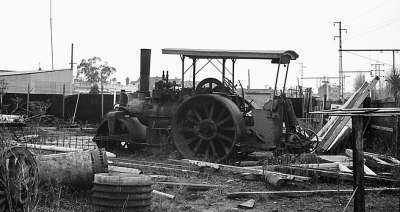 The Carlton Community History Group congratulates member Jeff Atkinson for winning a commendation in a recent essay competition run by the Prahran Mechanics Institute. 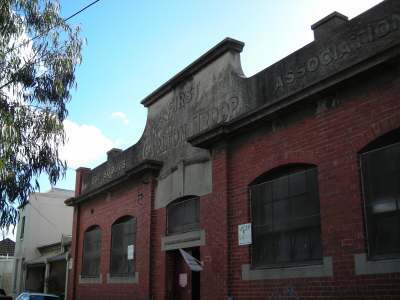 The Prahran Mechanics' Institute is a non-profit community organisation that operates a lending library specialising in the history of Victoria. One of its objectives is to encourage and facilitate historical research, and its Short History Prize was run as a way of achieving this. Entrants were invited to submit works relating to "a history of a place or an aspect of a place in Victoria". 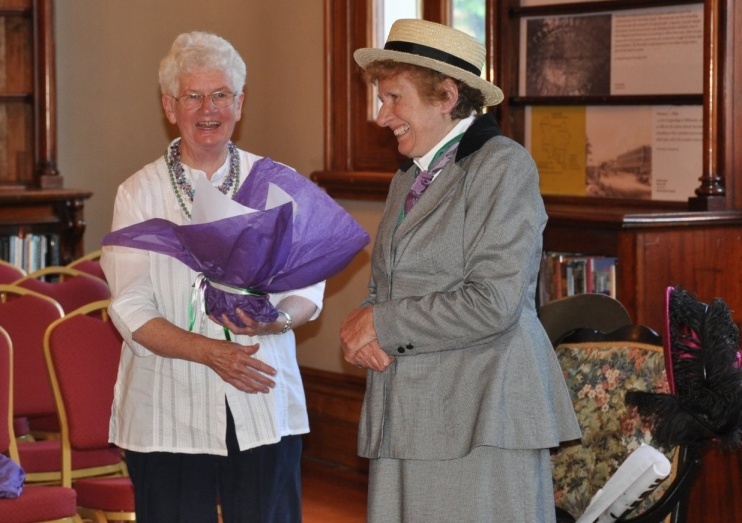 The winner, announced in October 2013, was John Merry of the Sandringham & District Historical Society for an entry entitled A Boyhood by the Bay : Personal Reminiscences of My Life in Sandringham in the 1940s. Two other essays were commended including Jeff's, which had been submitted on behalf of the Carlton Community History Group. His essay, entitled The Stockade : Carlton's Forgotten Prison told the story of a low security prison that operated from 1853 to 1866 in what was then bushland just north of the town of Melbourne, but which is now the built-up suburb of North Carlton. An extended version of Jeff Atkinson's essay was published as a book in 2018. For more information, visit the Publications page. Some time ago, CCHG put out a call for help in shedding light on the origin of the name "Station Street" in Carlton. The call has been answered by Carlton resident Mike Krockenberger, who has discovered a possible connection between Station Street and the Yan Yean tramway. A plan of allotments at Carlton, North Melbourne, Parish of Jika Jika, dated 3 August 1859, shows the area bounded by Station, Elgin, Nicholson and Neill Streets marked as "Land set apart for Yan Yean Tramway Terminus." In the 1850s Matthew Bullock Jackson proposed that a wooden tramway, built to aid pipe-laying for Melbourne's water supply from Yan Yean, could be converted into a railway line for carrying building materials and passengers. This major transport project never went ahead and the land was released for sale in 1863. The digitised map can be viewed online at the State Library of Victoria's website. Betty Burstall was an activist, a powerful presence, a mover and shaker, a thinker, a partner, a parent, a teacher, a potter and painter, a very special person. She is best remembered for the most public part of her legacy, La Mama Theatre, a Carlton icon. She had the courage of her convictions. She came back from a trip to America with the intention of trying to start a coffee-theatre like La Mama in New York, which had so impressed her. So in 1967, when confronted by a 'To Let' sign being hammered up on 205 Faraday Street, Carlton, a student area with an interesting ethnic mix, she hired it for about $14 a week to house a theatre group which aimed to perform modern Australian plays. The building had started life as a printing workshop and then became an underwear and shirt factory, not a usual theatre space, but it met at least two requirements - it was cheap and small. The people she gathered together now read like a Who's Who of Australian theatre whose stories are well documented. Betty established principles which the group of actors, playwrights and staff still follow: keep the space open and accessible, avoid debt, and stay within the community, all groups which were to amply reward her efforts. As Liz Jones, her colleague and successor, says, "La Mama has never been about grand ideas, it has always been a launching place for great minds and great ideas, and it has always been a place which allows all members of the community to have a say." As she pointed out it did not matter whether they were or are theatre people, indigenous people, itinerants, the unemployed, or street people. It was also designed to be affordable and intimate and, while Betty was no doubt pleased to be honoured by an Order of Australia in 1993, one has the feeling she saw it as a reward for all those who had worked with and supported her, in the special adventure which was, and is, La Mama. 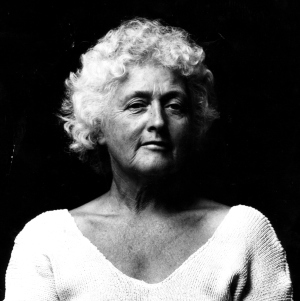 Betty was also influential in the development of her husband Tim Burstall's film career and he was a part of the fertile creative scene that centred on La Mama. Their two sons, Dan and Tom are also involved in the film industry. They have much to be proud of. On Saturday 17 November 2012 the Carlton Community History Group Inc launched their new publication Walking Along Rathdowne Street : 100 years of shopping, services and stories in North Carlton by Margaret Rich. As the acting president, Jeff Atkinson, commented, "What a fantastic book launch". Jacki Fristacky, our new Mayor, long term Nicholls Ward councillor and CCHG patron made an interesting and thought provoking speech. However, it was very crowded. We had between 55 and 60 people crammed into the meeting room and had to turn others away, for which we apologise. We sold many books on the day and have since had to reprint 100 more copies. The Library has already sold out its initial stock, the local post office has agreed to sell the books and we have had orders from as far afield as Provence, Ireland and New Zealand. Margaret's research skills and her experience as a teacher has made what could have been a pedestrian list into an interesting read. The enthusiasm generated also reflects the community's involvement with the suburb , the street itself and its history. As we had hoped, this book has already generated more local history to add to our collection. The Carlton Community Centre was established in the 1970s and offered community activities, school holiday programs and classes to residents of Carlton and North Carlton. Following the re-organisation of council boundaries in the 1990s, Carlton Hall was transferred from Melbourne City Council to its present owner, City of Yarra. 9Building occupancy information sourced from Sands & McDougall and contemporary newspaper advertisements. Did you see the TV show "The Pacific" when the soldiers came to Melbourne for their R & R? If you had, you would have seen US marine Robert Leckie visit his girl friend in a double storey house in Rathdowne Street. Then he visited his neighbour in a lovely double fronted house in Fenwick Street. This program has been screened all around the world showing a little piece of Carlton. Rocco 'Rocky' Pantaleo, who died in a road accident on 26 March 2010 at the age of 53, will be remembered as an important force in the rejuvenation of the Rathdowne Street shopping strip between Curtain and Fenwick Streets, North Carlton. Shops at both ends of this block have over more than a century always survived economic and demographic changes, but a number of shops in the middle of the block became private dwellings as early as the 1930s. One such was 392 Rathdowne Street, out of commercial use for thirty years when in 1974 Santo Aiello and a partner opened Porchetteria, later called La Porchetta. According to newspaper reports, it was in a run-down condition when in 1985 it was taken over by Rocky Pantaleo, who had arrived in Australia as a young man of 21 and speaking no English less than ten years before. It was the first of his tremendously successful pizza restaurants which over the years expanded into a huge franchised business and four frontages in Rathdowne Street. The steady flow of diners is a mainstay to local shops of all kinds and local residents and long-term traders alike acknowledge the importance of Rocky Pantaleo's contribution to these Rathdowne Street shops. In 2009 one of our members, Jack Ward, died. The Carlton Community History Group will miss him for a variety of reasons. Jack was not only a really nice man, cheeky, friendly and always on time, he was passionately interested in North Carlton where he and his brother George and his younger sister Froney grew up. Half brothers Jack and George Ward and sister Froney lived in Fenwick St and later Henry St on the edges of the Rathdowne street shops. Together their experiences cover the time from Jack's birth in 1934 to the family's departure for Doncaster in 1966 some 32 years later when Froney was 12. Their memories record changes in the shops, businesses, and the characters and actions of the people who lived around them. Jack found us after looking at a number of history groups, and he and George came all the way from Glen Waverley and Croydon to attend our monthly meetings. They have been a source of a great deal of information. Jack was influential in our Rathdowne Street project partly because of his persistence in wanting us to make a map of the shops. One day he stood up at a meeting and drew a startlingly accurate map of the shops in the area between Fenwick and Newry Streets. We copied that and it became the basis for some interviews with him and George supplemented by material from Froney. Suddenly the picture of Rathdowne Street was not only peopled with exotic, hard working Jews and Italians running businesses but well established, hard working, generous, and gregarious Australians whose community, lives and activities came to life through colloquial and somewhat less than politically correct anecdotes. That part of our history had somehow gone missing, perhaps because it might seem too ordinary. But history is more than great or extraordinary men and women. We will remember Jack fondly and will go on working with George and Froney as we know he would like us to do. Although he left school like many of his generation at 14, he obviously had a sharp mind and went on learning and contributing all his life. Local history would be poorer and less accurate without people like him. We thank him sincerely. Why Women of Davis Street? In 2008 the CCHG became aware of a chapter in They are but Women : The Road to Female Suffrage in Victoria, which looked at the lives of some women who lived in Davis Street who signed a petition in 1891 calling on the Victorian Government to grant votes to women. We acknowledge the contribution of that research and build on it to explore the similarities and differences between the lives of those women and some women who currently live in Davis Street. We know the petitioners wanted votes for women and we examine the attitudes of the contemporary women to the achievement of that goal. The work also raises the question of when we should be celebrating the centenary of suffrage for Victorian women. Should it be when the legislation was finally passed by both houses of Parliament in November 1908, the granting of Royal Assent and gazetting of the legislation in March 1909 or the first state�election when women actually exercised that right on 16 November 1911? The Carlton Community History Group thinks we should celebrate them all. We celebrated the passing of the legislation, in conjunction with the Yarra Council, in November 1908 with a performance by Wilma Farrow of The Immigrant's Friend and the Womens' Campaigner about the lives of Caroline Chisholm and Vida Goldstein, both ardent suffragists. We are currently celebrating Royal Assent and the gazetting of the legislation with a small display tracing the development of the campaign in the Carlton Library. We will celebrate again in 2011, 100 years after women first voted in a Victorian election. Did any of your forbears sign that petition?� If so, can you tell us something about them?� We have a list of all women in Carlton and North Carlton who did, but many others also come to the area later.� They could form the basis of our celebration in 2011. We also need to remember how easy it is to be confused about dates.�Most of us believe that with Federation in 1901 women were granted the right to vote. In a sense that is true, but the first election for Federal Parliament was held in 1901 under state electoral laws, all of which were different and women who lived in Victoria, New South Wales, Tasmania and Queensland were not able to vote.�We forget that in December 1908, after the suffrage�legislation passed both houses of parliament an election was held in Victoria but women could not vote then either because the bill had not received Royal Assent.�We also tend to forget that although after March 1909 women could vote they�did not get a chance to do so until 1911 and could not stand for state parliament until May 1924. In March 2009, more history has been made. The first woman has been elected as Premier of any state in Australia, Queensland.� Our contemporary respondents will take heart from that result.�But it is likely they will also be asking when Victoria will be�making this kind of history?